For the longest time, aluminum arrows were the preferred choice of many bow hunters. This was before the entry of carbon arrows in the 1990s. Today, a vast majority of bow hunters use carbon arrows. However, just because an arrow has a shaft made of carbon does not mean it is the best arrow. So how do you differentiate the best carbon arrows from the cheap knock-offs that litter the market? Well, you have to know what to look for in a carbon arrow first. And in this article, I will be giving you tips on how to find the best carbon arrows for hunting. Also, I will be reviewing seven of the best carbon hunting arrows I have used. The basic rule of thumb is that if you want the best carbon arrows for hunting, or for shooting you must need to do some research which we have done already here in this article for you. And we believe our recommended arrows will be the best choice for your good reason. But also, before buying carbon arrows, you must evaluate their performance and durability for your specific purpose. Some arrows best for hunting some for shooting. So Needless to say, there are some factors you need to consider when shopping for carbon arrows. These factors are outlined below. But before I get to the factors to consider, below is a table comparing the different carbon arrows reviewed in this article. The term spine refers to an arrow's stiffness. 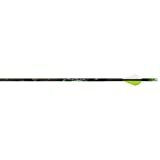 While carbon arrows are stiffer than their aluminum counterparts, it is important that you settle on an arrow with the right balance of stiffness. To check an arrow's stiffness try to bend it. If an arrow is stiff, it will be hard to bend. On the other hand, if an arrow is not sufficiently stiff, it will bend easily. Arrows that are not sufficiently stiff lack accuracy. Worse yet, they can be ploughed into by your best crossbow's strings. Thus, the best arrows for hunting need to be stiff but not too stiff. If you are a bow hunter and need a best arrow then probably you also need the arrow rest. For a perfect shot arrow rest play a vital role. Learn which are the best drop away arrow rest and get a better arrow rest for your bow and hunting arrows. Weight is another important factor to consider when buying carbon arrows. Arrow weight is also referred to as grains and depends on what you want to use your arrows for. If you want arrows for target practice or archery tournaments, lighter arrows are recommended. Also, the best archery target is recommended too for your practice from this perspective. However, if you want arrows specifically for bow hunting, heavier arrows are better. The reason being that heavier arrows offer more penetration power. On the other hand, lighter arrows are able to travel in a straight line better than their heavier counterparts. In my experience, the best arrows for both archery and bow hunting are those with a weight of between 200 and 500 grains. The straightness of an arrow is measured in inches and normally ranges from 0.001 inches to 0.006 inches. The smaller the number, the better or straighter the arrow. This means that arrows that have a straightness level of 0.003 inches or lower are pricey. That being said, if you want the best balance between straightness and price go for arrows with a straightness of 0.003 inches. The straighter the arrow the better it flies. The last factor to consider is the price. Different carbon arrows are priced differently. They can cost as low as $40 and as much as $100. 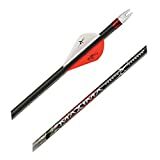 If you are on a tight budget, there are some pretty good arrows in the low budget segment as you will see in the reviews below. Pro Tip: If you are a crossbow hunter then it is advisible beside using the best arrows you should consider the best crossbow scope for getting a perfect shot. A crossbow scope will be a great addition in your hunting arsenal if you are prone to aim your pre perfectly. The Maxima hunter series of arrows had been out of the bow hunting scene for a while before making a comeback in 2011. And I have to say the new, and upgraded maxima hunter arrows are amazing. With a multi-layered and multi-material design, these arrows are lighter and straighter than most carbon arrows I have used. Also, the arrows' rear end is stiffer and lighter than the front. This means that the arrows have minimal oscillation when fired. The heavier front and lighter end add to the arrows' accuracy and penetration power. In my analysis, the upgraded Maxima hunter arrows, I found the arrows to be amazing to shoot. Also, they make for a good mid-range hunting arrows. Thus, although they are a bit pricier compared to other similar arrows, they are worth every penny you spend on them. Bottom line, these are among the best carbon hunting arrows. The Maxima Red Fletched Carbon Arrow is one of Carbon Express' best sellers. Loved by thousands of bow hunters, myself included, these arrows are the most consistent I own. And that's not all; these arrows feature a Buff Tough coating that protects the shaft. Additionally, these arrows have a dynamic spine that makes them compatible with bows with a draw weight of between 40 and 81 pounds. Also, I have been using these arrows for a while now, and they still look as they did when I bought them. Carbon express is the most known carbon arrow manufacturer in the world. Therefore, you should not expect anything less than excellence from the Maxim Red arrows. And while they are not cheap, they will be worth every penny you spend on them. Bottom line, the Maxima RED arrows are some of the best carbon arrows for the money. I am a proud owner of an Excalibur Matrix crossbow. So it was only natural for me to buy the Excalibur Diablo 18 inch carbon Arrows. These arrows have been designed specifically for Excalibur's Matrix line of crossbows. As you have probably already guessed, these arrows measure 18 inches. I have fired these arrows from my crossbow and have to say they shoot well. The insert is heavy, which increases front-of center weight. If you are looking for arrows crafted specifically for your Excalibur Matrix crossbow, then you need to check these Diablo 18 inch arrows. 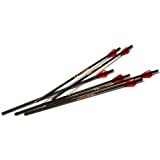 Additionally, if you are looking for the best carbon arrows for deer hunting, I strongly recommend these Diablo arrows. In summary, these arrows are ideal for deer hunting. Pro Tips: Learn which are the Top rated deer feeder from the link. Barnett is known more for its crossbows; however, the manufacturer does not excel in the manufacture of crossbows alone. This is evidenced by the superior performance of the Barnett Outdoors Carbon Crossbow 20 inch arrows. As their name suggests, these arrows are designed for high-performance crossbows such as the Barnett Ghost 350. Weighing 8.1 ounces and measuring 20 inches, these arrows are sold in a five pack. Additionally, these arrows have a 13.78 grains per inch, which is pretty impressive. Barnett is so confident of these arrows performance that it offers a five-year warranty on them. The Barnett Outdoor Crossbow arrows are the very definition of high-quality carbon arrows. For starters, they are strong yet lightweight. Additionally, they are offered at a reasonable price tag, which further adds to their appeal. In summary, as with most other products from Barnett, these arrows are some of the best arrows for deer hunting. I tend to be experimental with arrows and am always eager to try out different arrows. Thankfully, most of my hunting buddies do not use the same arrows I use. Recently, I got to fire one of my friends Victory Buck Buster Carbon arrows. I was impressed with these arrows that feature an aluminum shaft and measure 31 inches. Granted these arrows are relatively new in the market; they are worth purchasing. I really did love their performance and reliability. Additionally, these arrows are reasonably priced. The Victory Buck Buster victory arrows truly do live up to their name. In conclusion, these are some of the best hunting arrows I have used in recent times. Carbon Express' PileDriver Hunter Carbon arrows are crafted for serious hunters. However, these arrows can also be used for archery and target practice. Sold in six pack boxes, these arrows have a mossy oak finish that blends well with the installed neon vanes. In fact, these arrows are among the best-looking arrows out there. As with all other Carbon Express, these arrows are laser checked to 1/10,000 of an inch. What I really love about these arrows is their versatility. The PileDriver Hunter arrows can be used for almost anything. Granted these are some of the heaviest arrows from Carbon Express, they do offer amazing penetration power. Furthermore, these arrows are great for long range hunting. It is for this reason that I recommend these arrows to anyone who is serious about their hunting. In fact, these arrows are arguably the best hunting arrows from Carbon Express. The Gold Tip Hunter XT arrow is one of the most reliable and loved. The toughness of these arrows makes them appealing to many bow hunters. And with a grain weight of 8.2 inches, these arrows are also some of the priciest on the market. However, there is a good reason why these arrows are costly. For starters, they have a straightness tolerance of 0.003 inches, which is more than impressive. These arrows are sold in a dozen pack. One of the best things about these arrows is that they come in a variety of color options. The Golden Tip Hunter XT arrows have been around for some time, and this makes them a reliable option for most hunters, especially first time hunters. Not only are they reliable and incredibly tough, but these arrows are also accurate and offer impressive penetration power. When you go out shopping for a set of new carbon arrows you are sure to find a wide array of arrows to choose from. However, not all the arrows available on the market can meet your needs. In this regard, some research is needed before you make a decision. Going through online carbon arrow reviews can be the best place to start. More importantly, the compound bow arrows reviews above will help make you an informed decision. It is my hope that the above bow hunting arrow reviews have been of help to you.